Under the Hood has now been added. Others already online include: 1963,Mermaid Beach, Freakout, Reverb Beach Flight of the Surf Guitar, Black Jaguar & Surfride. Check back regularly for new ones. July 2010: 3 new Instromania gigs announced. Find out more at Instromania.com.au. Check out the Instromania gallery. Martin & John Hall were interviewed by Richard Stubbs on ABC radio on the 4th of June about Instromania. Listen to Richard’s interview with Martin & John (as well as a cracking live performance of ‘Bombora’) here . The story of how the guitar used on “Revenge of the Surf Guitar” was reunited with its former owner after 40 years. Read the story here. The Altantics launched the “Live at Freshwater” DVD at The Basement in Sydney on the 19th of January. See a gallery of photos from the night. Read some reviews of the Odd One Out, including a 4/4 star review by English Instro mag New Gandy Dancer. The Altantics are launching the “Live at Freshwater” DVD at The Basement in Sydney on the 19th of January. More info. 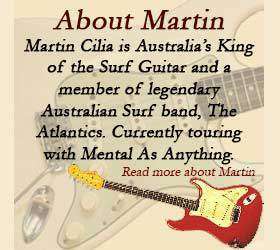 If you’re in Melbourne come along and see Martin along with Phil Emmanuel, Bob Spencer, Dennis Wilson & Phil Manning at 4 shows. For more details and booking links click here.